The winners of the Excellence In Communications Award for NCAA Cross Country were named Monday by the U.S. Track & Field and Cross Country Coaches Association (USTFCCCA). Katie Morgan of San Francisco (NCAA Division I), Denise Archetto of Stonehill College (NCAA Division II) and Shawn Medeiros of Endicott College (NCAA Division III) all took home honors for their incredible work during the 2017 cross country season. A multitude of nominations flooded in and Archetto, Medeiros and Morgan stood out from the rest. 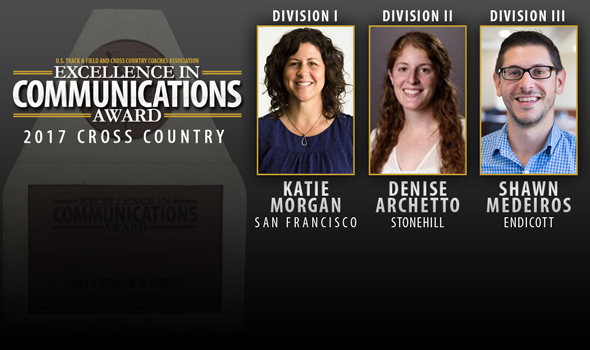 The USTFCCCA Excellence in Communications Award recognizes those athletics communications representatives at schools and conferences who have committed to excellent coverage and support of collegiate cross country. Winners were selected by the communications staff at the USTFCCCA National Office. A program on the rise needs cutting-edge coverage. That’s what Katie Morgan delivered for the University of San Francisco this year. Morgan, the Director of Creative Video at USF, chronicled the Dons throughout the season as they made their breakthrough run. She followed USF as it went from No. 10 in the Preseason National Coaches’ Poll to a runner-up finish at NCAAs. "Her videography and production are of highest quality and she has creatively produced beautiful and inspiring pieces highlighting the competitive aspect of our sport as well as unique human interest stories behind our student-athletes," San Francisco coach Helen Lehman-Winters wrote in the nomination. "These videos have not only generated interest on campus, but they have been aired on NBC television (Behind the Mask Series) which has increased awareness for our student-athletes, university and sport within the larger community." CLICK HERE to watch Morgan’s recap of the 2017 NCAA Division I Cross Country Championships. You can see more of her work in the accompanying playlist. Despite being just one of two in a department that covers 21 sports, Denise Archetto has delivered on her personal promise to enhance the student-athlete experience from what she did the season before. In her second year at Stonehill, Archetto has provided an ample amount of attention towards the Skyhawks’ men’s and women’s cross country programs by using fresh, new ideas to promote her teams. The heavily-nominated Archetto created "Game Day" graphics for social media, as well as ranking graphics for the USTFCCCA Regional Rankings and National Coaches’ Polls. While most major athletic departments have a marketing department that puts together a schedule poster for each athletic program, Archetto took it upon herself to create her own that featured the programs’ seniors and seven meets on the season. Additionally, she previewed the four major championship meets in which the Skyhawks competed by creating videos that highlighted interviews with Karen Boen and some of her student-athletes. Highlight videos were also made upon completion of each meet. "Shawn Medeiros served as a great contributor to the increased exposure of the men’s and women’s cross country programs through the use of social media, added features on the EC Gulls website and creating video content. These outlets became a great source of information and insight of our program to family, friends, the Endicott community, the NCAA community and prospective student-athletes. There was a professional expectation of the content created and produced which allowed for a great user experience. Most importantly, the student-athletes felt more recognized and appreciated for their hard work and creation of this team’s culture by way of these pieces collaborated and created by Shawn Medeiros." Medeiros is the perfect person to win this award in NCAA Division III. He is one of four people in the Athletic Communications Department at Endicott College, yet covers 11 sports including men’s and women’s cross country. In the lead up to the conference championship, Medeiros created a video series highlighting team values and created a record book for all-time performances, among other initiatives. Medeiros also assigned photographers to shoot three different meets and pitched features to athlete’s hometown newspapers.